If you have been to a fiber festival in Germany, chances are that you know her colorful yarns: Nicole Seelbach, also known as "Buntwurm" (in German it means something like "color-worm"...), loves to present her creations live and enjoys to see how knitters react to them: "That's just so much fun!" she said. Her love for fiber fests may stem from her professional background: Nicole has trained and acquired a "Meister" title granted by the German Guild for her profession, which deals with creating and installing illuminated signs – so she's part electrician, printer, metal worker, painter and typesetter. And she really knows who to catch the attention of people strolling by! 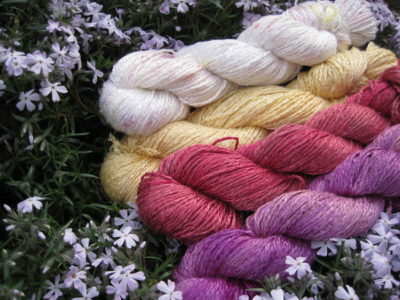 Colors and design were also a part of her training, so that brings us close to the topic of dyeing wool. "After my Meister exams I took a job in Hamburg, and that's when I started to knit again", Nicole said. She loved to browse the yarn stores in Hamburg, but one day she just could not find the color that she had in mind for her next project. "I was looking for a mustard yellow, and at the time it was so out of fashion that there was just no yarn available in that color." But Nicole really wanted to make a hat and arm warmers in that specific color to give a friend on her birthday – so she dyed it herself. It worked: "My friend loved her gift!" At the time, Nicole was not really aware that hand dyed yarns were a thing: "I realized that they were kind of trending when I went to my first fiber festival", Nicole said. 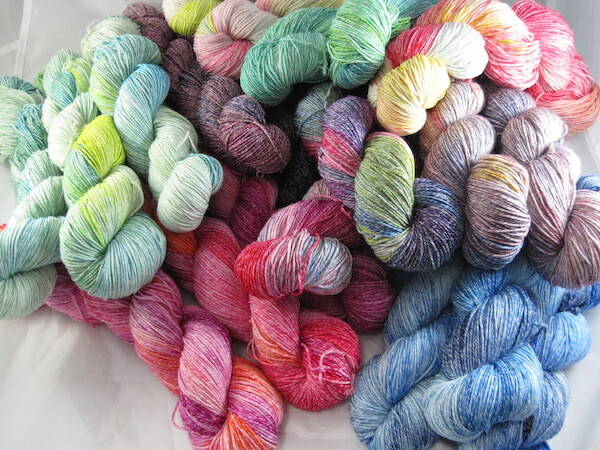 She started dyeing yarns on the weekends and sold them on facebook and on small fiber festivals, and since she returned to her native close to Frankfurt in 2016, she has been dyeing full-time: "My dyeing workshop in our basement works just fine – for now! 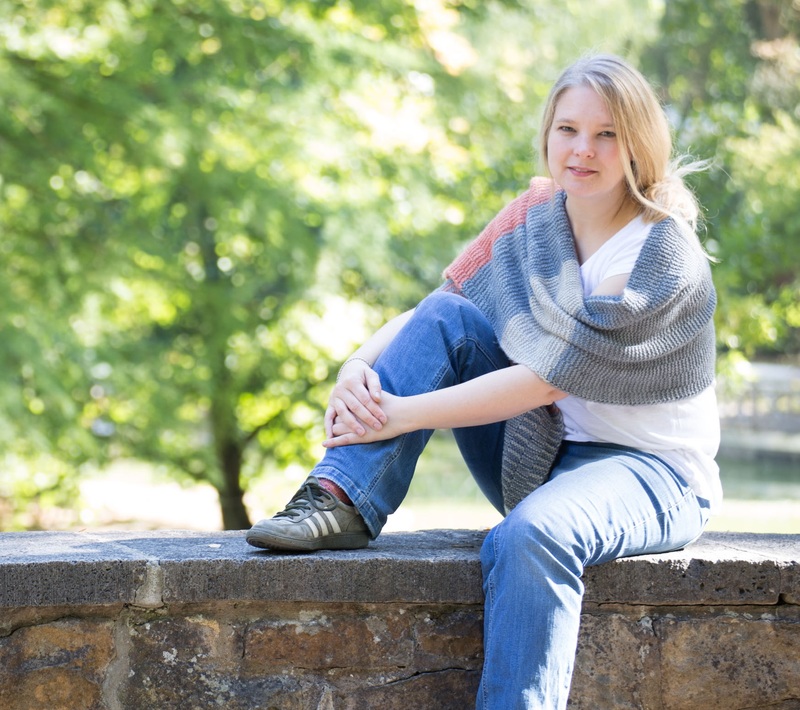 I have a feeling that I will grow out of it pretty soon..."
When Nicole knits, she loves to use yarn with alpaca fiber: "I am a big fan of laceweight alpaca for a shawl and also of the heavier qualities." She also likes breed-specific yarns from sheep, even if they tend to have a bit more structure to them than merino yarns: "To me, one of the most important aspects when choosing a yarn is that it has been produced in an animal-friendly fashion", she said. 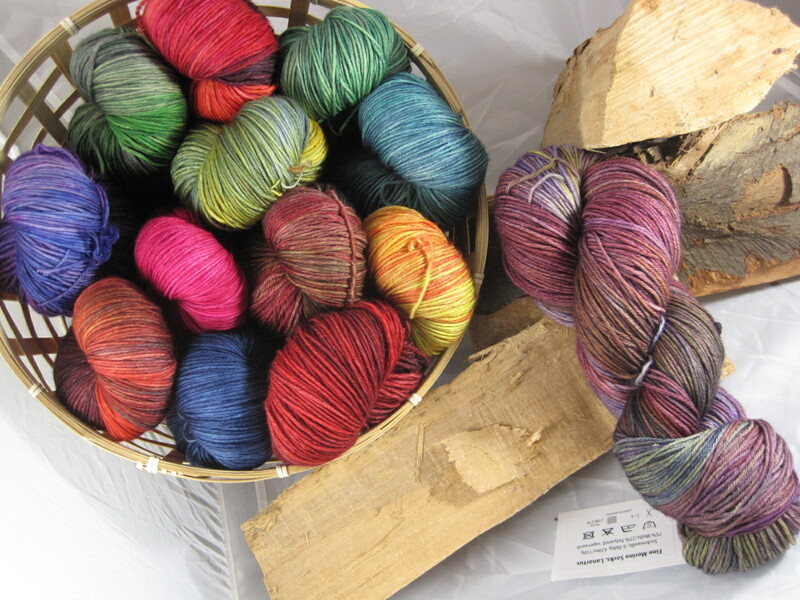 Nicole is not tempted by industrially dyed yarns anymore, but regularly shops at other handdyers' booths: "I love that every one of us has their own style of dyeing yarn, and I think it's super fun to knit with them." Nicole's yarns cater to every knitter's needs: She carries yak and viscose yarns for those who are allergic to wool, cotton and bamboo blends, sturdy sockyarns and supersoft merino. "I constantly strive to improve my dyeing skills and to challenge myself", she said. 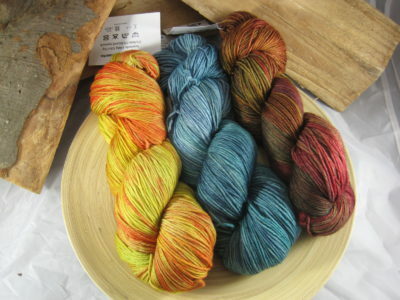 How a yarn behaves in the dyepot, how to achieve a certain effect and the best result – for Nicole, that's a question of knowledge, experience and the art of the craft. But it also depends on her mood how a day in the dyeing workshop will go: "If I feel like using lots of colors, I will choose a sockyarn. Otherwise, I will work on yarns more suitable for shawls and sweaters", she said. Right now, her favorite colors to dye are berry tones from deep purple to light lavender, "which is funny, because for myself I would always choose colors from the autumn pallette", Nicole said.